IT administrators often consider our friends at Better Cloud when looking for user and directory management solutions. We are often asked if Jump Cloud and our Directory-as-a-Service (DaaS) platform is competitive with Better Cloud, since DaaS also provides user and directory management solutions. Take a closer look, and you’ll realize that Better Cloud and JumpCloud are largely complementary. For user and directory management, there are minor areas of overlap, but those overlaps are quite small. What’s more, both solutions really have different focuses for IT admins. Better Cloud’s solution aims to be a management control dashboard for Google Apps and Microsoft’s Office 365 solution. In doing so, Better Cloud gives IT admins the ability to monitor, manage, and audit their activities within Google Apps or Office 365. What’s more, Better Cloud enables IT admins to audit license use, grant or deny permissions for files, provision and deprovision users, manage groups, and decide whether third-party applications should be added to the platform. In short, Better Cloud functions as an intelligent management console for Google Apps and Micorosft Office 365. JumpCloud’s Directory-as-a-Service, also known as DaaS, authenticates user access, authorizes access to devices, applications and networks, and monitors and manages user access to the full-range of a company’s IT resources. In short, DaaS serves as the core, authoritative user store for an organization. The user database is complemented with a number of authentication protocols, such as LDAP, SAML, RADIUS, REST, and others. The goal of JumpCloud’s DaaS is to securely connect users to their laptops or desktops, servers, WiFI networks, and cloud-based or on-premise applications, to name a few. Better Cloud and JumpCloud’s ability to provision and deprovision users is the only area of overlap between the two solutions. It’s the one thing they have in common. In JumpCloud’s case, DaaS continues to remain the authoritative source of the identity. Conversely, Better Cloud passes on the credentials once the user has been created and does not store their credentials. Rather, Better Cloud acts as a proxy, not an authoritative source. Aside from the small overlap of provisioning and deprovisioning users, both Better Cloud and Directory-as-a-Service solutions are quite different. Better Cloud focuses on managing user access within Google Apps and Microsoft Office 365, whereas JumpCloud focuses on user management across an array of devices, applications, and the network. Many organizations choose to leverage both Better Cloud and JumpCloud together, since they are complementary solutions. In those cases, JumpCloud acts as the authoritative user directory, while Better Cloud directly syncs its user database with either Google Apps or Office 365. Together, both solutions deliver incredible value to IT organizations. 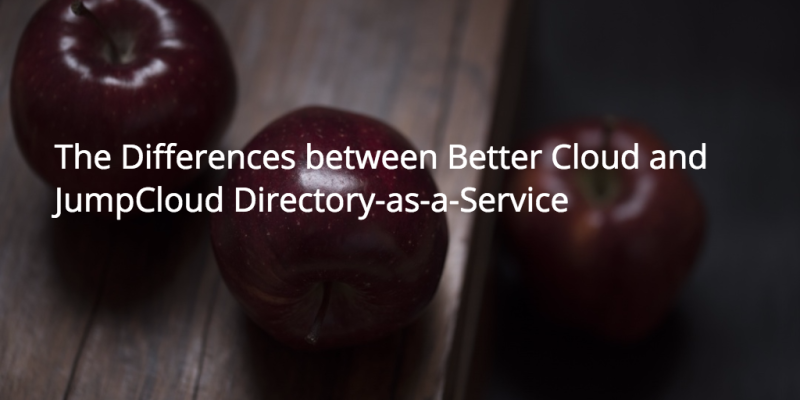 Want to learn more about how Better Cloud and JumpCloud’s Directory-as-a-Service complement one another? Drop us a note. We’d be happy to discuss it with you.